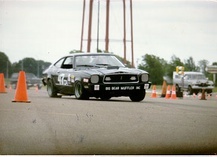 Forums » Grassroots Motorsports » any 80's GM G bodies around here? hello all. 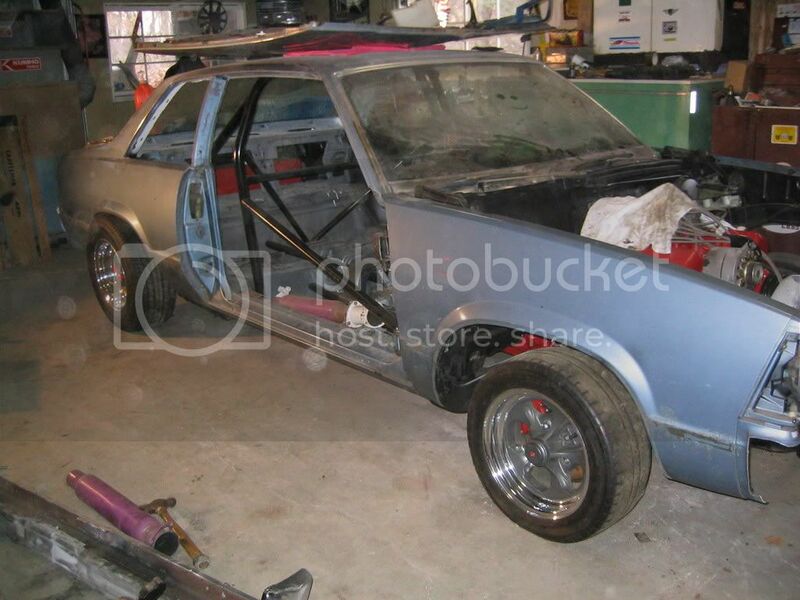 i've got this 87 Monte Carlo SS carcass that i want to build into an autocrosser for SOLO events with the occasional open track day at Brainerd, MN since it's only 50 miles away. anyone know any killer low dollar tips for building a basic low dollar car? the plan so far is to take off all the unnecessary stuff- heater, lights, most of the interior, etc- and build a car that handles decent using 305 power backed with a TH350, then upgrading the motor/trans/rear end down the road. i've got some low dollar brake upgrades knocking around in my skull, and have been reading up on which junkyard vehicles can donate things like springs. I have an 80 Cutlass I am getting ready to build. My front end needs some work and I found a 83 or so Regal with good metal at my local yard I might try grafting on. One thing is stiffen out your chassis there are many varied frame supports found in the different G bodies that when all added together make for a nice stiff chassis. Are you going to trailer it or keep it street legal? I had a '79 Malibu that was rust free. I gutted it, removed all extraneous material from inside the doors, including glass and window tracks. Think of a bigass motorcycle, when it rains you get wet, when it's cold you gotta bundle up. Check your class specs, but moving the firewall and engine back a few inches helps weight distribution. Look at the rear suspension, those four U-shaped punched out metal thingies holding the rearend on, weld in a fourth side, makes them stronger. If it's a unibody, get frame connectors. A cage really stiffens things up too. If you remove the headlights, put snorkels from the light up to the air cleaner. If you keep the headlights, the '79 had 3 X 4" turnsignals that donated the space. Fresh cool air into the carb, ahhhhh. Fuel cell, and put the battery in the trunk. You might also want to talk to Andy Nelson, he's made some kind of unholy alliance with the devil to learn 305 speed secrets. I'd look into all the circle track parts that are available for that car. If you have much circle track racin' around your area, look for the swap meets that those guys attend. They'll dump all their old stuff, but also some good parts get outlawed w/ rules changes. Those parts show up at the swap meets for super cheap. And if you're lookin' to spend money, www.speedwaymotors.com will have everything you could think of. Must be old age creeping in, I forgot all about roundy rounder swap meets. Andy helped quite a bit when I had an HO-305 for the Corvair project. Knowlegable guy. I dont have one, but I would imagine some reallly stiff springs, and some tall front spindles, and aftermarket control arms that give you more caster would be a good first step. Probably some wheels and tires in whatever size you plan on using would be good too. You could apply all of the information Andy gives there to a 305 if you feel married to the thing. The problem there is, with your normal 2 valve head, the smaller bore of the 305 is going to do more to shroud the valves vs. the 4"+ bore on the 350, 400, etc builds. You would also be smart to run through the valvetrain and check rocker to valve head contact at every valve, 305's seem to have odd guide wear as they age worse than comparable vintage 350's. Hot Rod Magazine is where I would start searching for 305 buildups, they've done some stuff with these smaller bore SBC engines. thanks guys. i'm not married to the 305- i've just got one and i'm going to put all the effort into making it stop and turn before worrying about power. i know a little bit about building a stout 350, it's really way too easy. and i've got that LT1 out of a 94 Caprice that is looking for a home that needs about $500 in parts to make it functional. the 305 just needs a head and gaskets. the car is going to be a dedicated race care- no street legal stuff here, but i'm kind of stuck with the stock 15X7 wheels and whatever decent tires i can fit on them for the time being. i'll probably be tempted to steal the 16" GTA's off my 84 T Type, tho. believe me, i've been looking at all the "metric" circle track stuff, but the stock setup will have to do for the time being. i do, however, have these visions of a 3 link rear suspension that i might play around with if the stock rear end blows and i need to stick something better under there. While there is nothing wrong with a 305 for normal driving. I have seen way to many come apart under hard driving. I would probably put the LT1 in if it was my car. Check Summit Racing. They have a lot of suspension parts for G-bodies. I have heard subframe connectors do wonders for G-bodies. a G body is a full framed car- so there is no need for subframe connectors. but my car does have some extra bracing compared to the average G body, and i'm going to add some more. right now, NAPA and the local junkyard have all the suspension pieces i need, but i'm probably going to be needing help with things like alignment specs and what not when i actually get going on the car. I've had several Malibus and a Cutlass. Still have an 81 Malibu now. Low dollar tip. If you want to keep the 305 and put a bigger cam in it get the rocker arm studs pinned at a machine shop to keep the studs from walking out of the head. thanks, but i don't care about making power with the 305- stock will be just fine with a set of headers and a good carb on top of the Weiand 4 barrel intake i've got sitting on the shelf. i know all about building motors, as i've done a few motors in my day. a few 350's for me ranging from a couple of $150 Norhtern kits to the $4k i dumped into the vortec headed/HOT cammed 355 that was in my '71 Nova, a couple of big blocks for other people, and even a 302 for a friend's '89 Mustang. if i was going to try to make power with my 305, i'd be throwing the stock heads in the dumpster and getting something better that already has screw in studs. one thing i've never done before, tho, is build a car for all out handling and nothing else. my Nova came close- it rode and handled like a newer Camaro and stopped like a Vette, but it was still a street car with a full interior, heater, lights, and radio that got driven in everything from 100+ degree summer heat (with no AC- just the basic heater) to that one late November ice storm/blizzard that i got caught in 30 miles from home. If anybody needs a fender my challenge parts car had a very good one which I still have, its a passenger side front. Also have the T350 trans with shift kit. One problem with the metric frame cars is that the front suspension is the worst design you can work with. The upper a arms are angled downward, which is not good. You can order a set of tubular upper a arms from a company like Global West. Match them up with spindles off a mid 80's Cadillac. The spindles are taller, the brakes are bigger, and it has the popular 5 on 5 bolt pattern oval track racers prefer. You will also notice the steering gets a bit quicker as the Cadillac spindles have shorter steering arms. I have a 1978 Monte Carlo for a daily driver, soon to be track car, and the Cadillac spindles are the best thing you can do without cutting up the front end. Getting lowered springs or cutting a coil off is also a good idea along with a polyurethane front end kit. If you plan on keeping that car for a while and running it hard, I'd also look into a Ford 9 inch rear or a GM 12 bolt. The stock rear end in that car is one of the weakest from GM.With all the stuff I've done to my car, it still has understeer from hell. Any of the B or D body spindles with 12" discs using aftermarket upper arms are a great upgrade. It will kick the front wheel track out a tiny bit but no worries. If you want to keep the 5x4.75 pattern, you have two basic options: Either pony up the crazy money for WS6 rotors, or have the B-body rotors redrilled. The only difference between WS6 12" rotors and B-body 12" rotors is the bolt pattern, but WS6 rotors cost about twice as much. The rear suspension geometry isn't too bad, but its plagued with really weak trailing arms. Fabricate some adjustables using spherical rod ends to eliminate the binding associated with bushings and you'll improve it by leaps and bounds. While you're scavenging GTA rims, grab the sway bars as well. The front bar from a WS6 matched up with a regular F-body rear bar is a pretty good match. If you go with the WS6 in the back as well, it tends to get a little too tailhappy for my taste. A lot of guys also do the Herb Adams sway bar front and the Hotchkiss bar rear and say its a good match, but a bit more expensive. You will also notice some nice firming of the axle movement if you use a Panhard bar. I know that triangulated 4-links don't really need it (especially if you go with spherical joints instead of bushigns) but it is a super cheap way to really keep that axle where its supposed to and not let the body toss it around. You will also gain some stiffness if you remove the factory rubber body mount isolators and use some big stacked washers (or machined spacers) in their place, but I've seen broken windshields happen that way. That was mostly drag racing, but I can imagine the same damage happening in other events. After that, I suggest a small cage, roll bar, or other means of firming things up. i've got the GTA angle covered- those are my favorite wheel. they are light, strong, and look good on everything. i've got two full sets, with the 4 fronts mounted on my T Type right now- which leaves me with the 4 rears that i could use. but i'd need at least a 1/4" spacer on the front and about a 1" spacer on the rear for that unless i get the offset changed, which would be possible since i've got the non dimple GTA's that are two piece wheels and know some damn good welders that are set up for doing stuff like that. i do know that they clear the steering arm on an 80's Caprice or 70's Monte Carlo spindle, since i had the 4 rears on an 86 Caprice and on my 74 Monte. i do have a set of 74 Monte spindles collecting dust.. but for now, i think i'm gonna limit myself to the stock 15" aluminum Monte SS wheels, since i've got 7 of them that are straight but aren't nice enough to sell to anyone. now that i'm thinking about tall spindle swaps, i've been poking around on stock car chassis websites, and they sell upper control arms in "long" and "short" versions. would the "short" versions be for using the taller spindles like the 74 Monte spindles i've got taking up space? i found one place selling the arms for $49.95 each without balljoints.